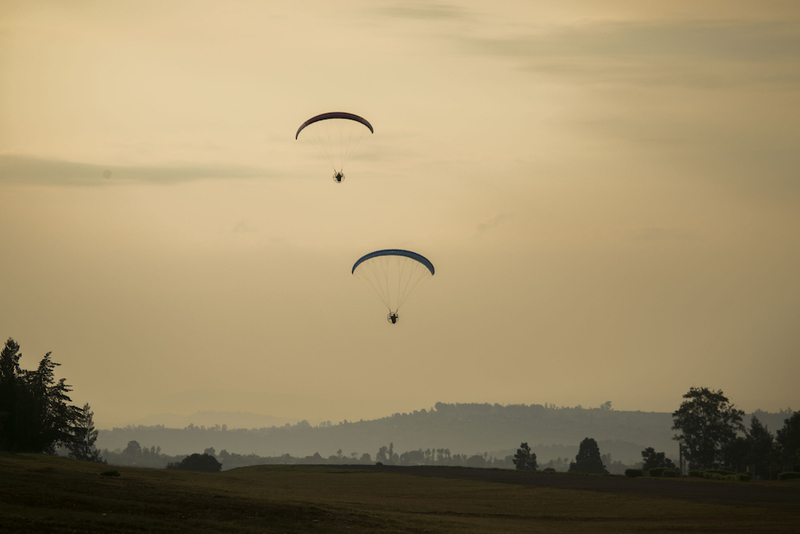 The Rwanda Development Board, in partnership with the Rwanda Flying Club and the Rwanda Civil Aviation Authority, has introduced paramotoring (powered paragliding) to its adventure tourism offerings. Paramotoring is a form of paragliding where the pilot wears a motor on his or her back (a paramotor) which provides enough thrust to take off using an adapted paraglider or paramotor wing. It can be launched in still air, and on level ground, without assistance. Members of the Rwanda Flying Club, Alain Julot and Sebastien Houben, demonstrated paramotoring to local media at the Huye aerodrome today. The new adventure tourism experience will be officially launched in six months and visitor will be able to enjoy paramotoring in the historic Huye town, the picturesque lakeside towns of Rubavu and Karongi and at one of the best preserved montane rainforests in Africa, Nyungwe National Park. “Rwanda is the best destination for adventurers seeking memorable, sustainable tourism experiences in Africa. We are happy to be soon introducing paramotoring, our new tourism experience. We will be the only country in East Africa offering such an experience. Visitors will now be able to experience the vibrancy and beauty of our country in a fresh way. Visit Rwanda and discover just why our country is the new adventure tourism mecca of Africa”.